The Christ Pantokrator Complex that included the mausoleum of the imperial dynasty, a monastery, a hospital, an orphanage, a home of the elderly and a poorhouse was founded in 1118 by Empress Piroska-Eirene and Emperor John II Komnenos. The construction (today Zeyrek Camii), the second largest Byzantine church still standing in Istanbul after the Hagia Sophia, is the most significant monument of twelfth-century Byzantine architecture and a UNESCO World Heritage Site. 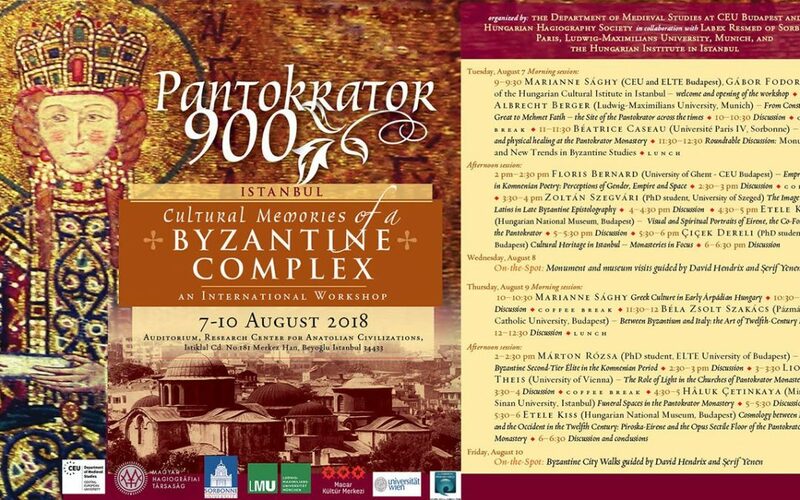 To commemorate the nine hundred years of the Pantokrator Complex, CEU Medieval Studies Department, the Humanities Institute of the Hungarian Academy of Sciences, the Hungarian Hagiography Society organize an international conference on the social, architectural and artistic meanings and memories of this outstanding monument that brings together scholars and fuses several scholarly traditions, from German through French to American and Turkish. The international and multidisciplinary interest in the Pantokrator complex is shown by the conference speakers — Albrecht Berger (Ludwig-Maximilians University, Munich), Floris Bernard (CEU Budapest), Béatrice Caseau (Université de Paris, Sorbonne), Hâluk Çetinkaya (Mimar Sinan University, Istanbul), Etele Kiss (Hungarian National Museum, Budapest), Marianne Sághy (CEU and ELTE Budapest), Béla Zsolt Szakács (Pázmány Péter Catholic University, Budapest), Lioba Theis (University of Vienna), Çiçek Dereli (PhD student, CEU), Yuri Rudnev (PhD student, CEU) Zoltán Szegvári (PhD student, Szeged University) Márton Rózsa (PhD student, ELTE Budapest), Şerif Yenen, David Hendrix (Istanbul) – who come from different scholarly backgrounds but share the same passion for the history of Byzantium. 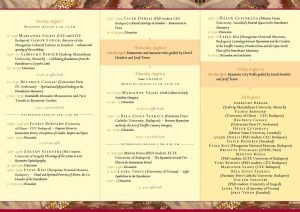 The conference initiates interdisciplinary dialogue and debate on Byzantine and Ottoman history, archaeology, art history, religious studies, cultural heritage, and offers new perspectives on this oustanding foundation serving both the representation and eternal memory of the Komnenos dynasty as well as the social needs of the Byzantine capital. Scholarship on the Pantokrator Monastery started in 1923 with the study of Hungarian Byzantinologist Gyula Moravcsik entitled Szent László leánya és a bizánci Pantokrator-monostor. Die Tochter Ladislaus des Heiligen und das Pantokrator-Kloster in Konstantinopel. Budapest-Konstantinápoly: A konstantinápolyi Magyar Tudományos Intézet Közleményei – Mitteilungen des UngarischenWissenschaftlichen Institutes in Konstantinopel 7-8 In 2013, Sofia Kotzabassi edited a volume on the history of the Pantokrator between the twelfth and fifteenth centuries. A conference organized in 2015 at CEU Budapest explored the spiritual and cultural context of the Pantokrator Complex focusing on the spirituality of Piroska-Eirene, daughter of King Saint Ladislas of Hungary and Adelhaid von Rheinfeld and on twelfth-century German-Hungarian-Byzantine diplomatic contacts. 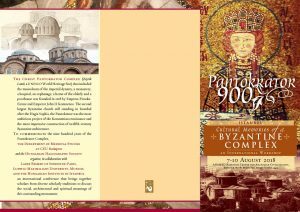 The conference volume edited by Robert Ousterhout and Marianne Sághy is published by CEU Press in 2018 for the 900th anniversary of the Pantokrator complex. The art of the Pantokrator and the monastery, hospital and poorhouse’s place and function in the urban tissue of twelfth-century Constantinople has not yet received the attention that this impressive foundation deserves. To maximize the understanding of the Pantokrator/Zeyrek Camii complex, special walking tours will be held in twelfth-century Constantinople that offer hands-on experience of the monuments. The walks are led by Şerif Yenen and David Hendrix as our cultural tour-guides. THE WORKSHOP IS OPEN TO THE PUBLIC!